In 2018, big things happened in the Spanish start-up ecosystem. Spanish start-ups hit the headlines throughout the year – led by poster-child Letgo (the second-hand shopping app) securing €430 million in new funding from Naspers. Time after time, focus is being drawn to the start-ups starting out in Spain and the heavyweights emerging from this burgeoning ecosystem. 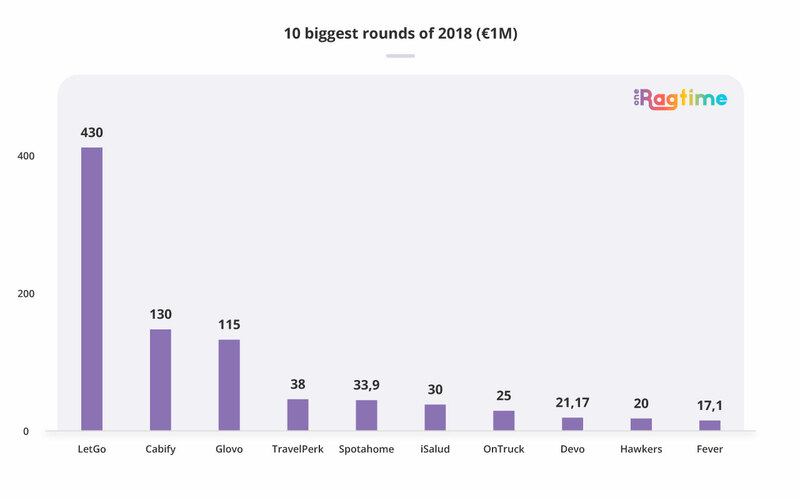 Over the past few years, there has been a growing stockpile of Spanish start-ups solidifying a reputation of both big fundraisings; Cabify (€130 million) and Glovo (€115 million), and big exits; Ticketbis (€175 million), SocialPoint (€232 million), Privalia (€500 million)… While they are fewer in number than we see in Germany, France and the U.K., the start-ups that do well achieve big fundraisings and eye-watering exits. 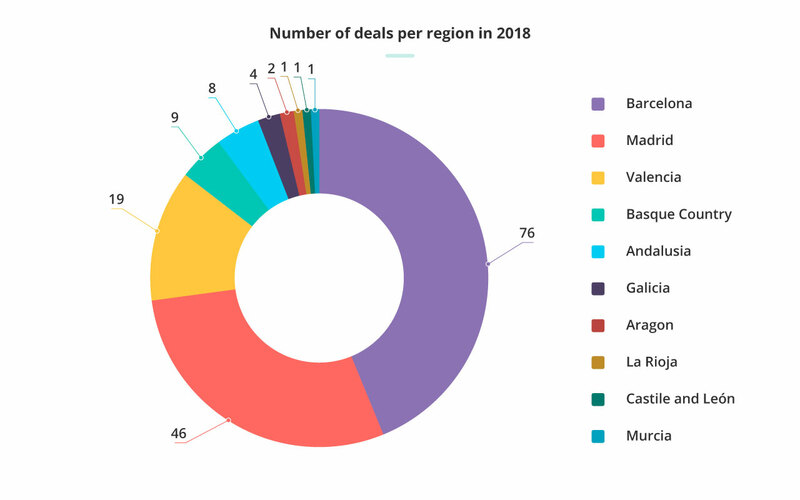 2018 has been a strong year for Spanish start-ups, and we want to look at why. What’s been cooking up success in this sunny southern peninsular in 2018? Disclaimer: we’re partly based in Barcelona, and maybe a little bit biased towards this awesome, up-and-coming ecosystem. Spain returned to its pre-crisis economy size in 2017, an achievement boosted by some big tech successes. 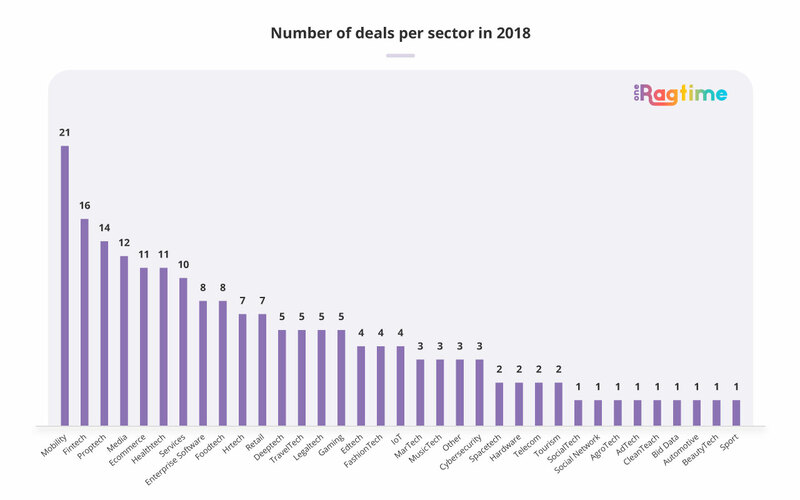 According to Dealroom, 2017 set a record for the amount raised by Spanish start-ups in VC rounds at a strong €900M, that’s an increase of over 350% in 5 years. 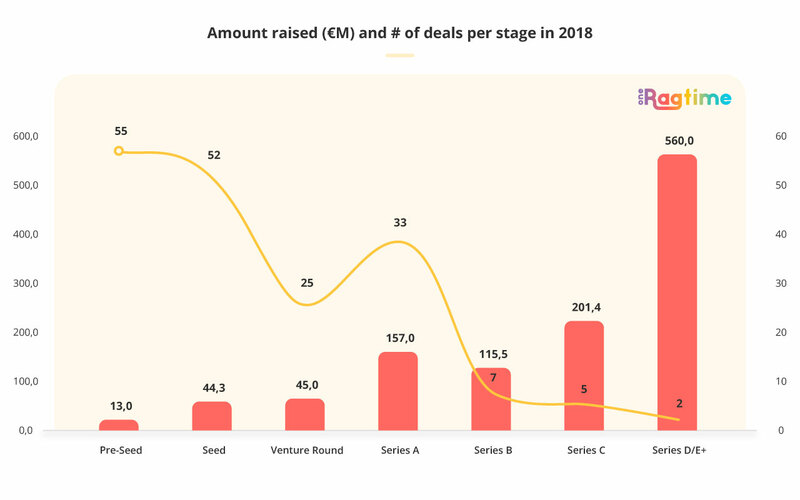 In 2018, that total has raised to €1.3 billion (including biotech), with 34 exits. Barcelona ranks 5th in Europe after London, Paris, Berlin and Dublin for the number of start-ups, too, but Spain benefits from a decentralised ecosystem… 34% of Spain’s start-ups are based in Barcelona and 31.5% in Madrid. This geographical spread of start-ups is healthy for any ecosystem, and two great hubs better than one. With 139 co-working spaces, Spain has the second most in Europe… a huge feat that’s testament to the cheaper cost of living and fantastic quality of life on offer, and one of many reasons why we have based ourselves in Spain. The start-ups are then supported through initiatives like ACCIO and Barcelona Tech City in Barcelona, and Madrid Startup House and Google School for Entrepreneurs in Madrid. In Barcelona, the lifestyle, low-costs and spirit of innovation have also attracted major corporates like Amazon, King and Microsoft. What does all of this indicate? Strong signs of a growing ecosystem whose exits will come to fruition in the near future. According to the Global Startup Ecosystem Report 2018 from Startup Genome, the number of exits in Barcelona alone has quadrupled in the past five years, averaging one large exit per year, whether as an acquisition or initial public offering (IPO) of at least $100 million. So, what factors could be coming into play here? Education plays a big role in the strength of Spain’s ecosystem. Spain has a tertiary education rate of 40.1%, coming in 1% higher than the European Union average, and it’s the 4th biggest exporter of talent according to Atomico, showing the strength in the education system. Atomico data also shows Spain to be the 3rd top destination for European talent, thanks in part to the top quality of life offered to those who move there. What’s more, three Spanish universities (IE Business School, IESE Business School and ESADE Business School) made the top 10 in the Financial Times’ annual European Business School Rankings for 2017. IESE Business school has in fact been ranked the number one executive education programme by the Financial Times for three years running. The turning point in Spain’s start-up success could be pinpointed to 2013, when government support came to the ecosystem in the form of the FOND-ICO Global. 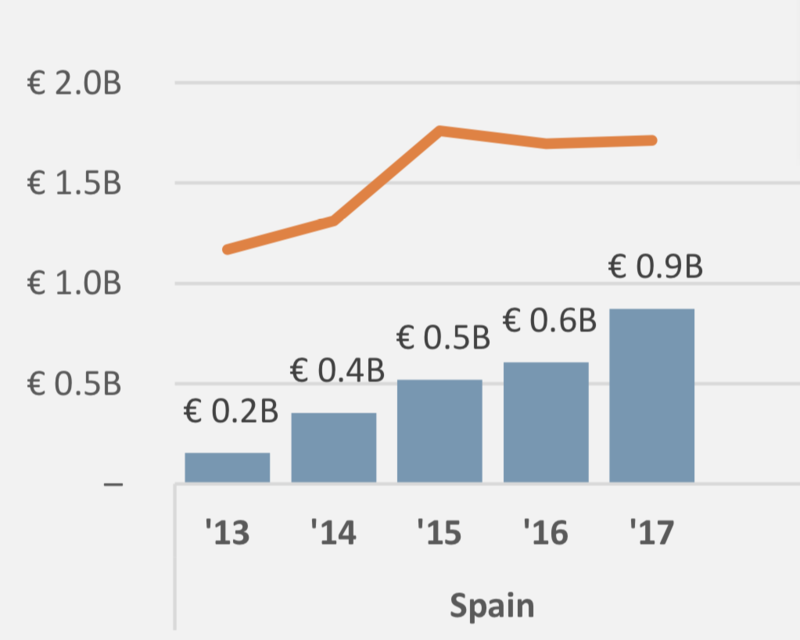 The €1.5 billion public “Fund of Funds” was the first of its kind in Spain, created to support the creation of the venture capital funds themselves that would then invest in up-and-coming start-ups. Since then, the floodgates of venture capital funding have opened, growing from €200 million in 2013 to over €1 billion in 2018. In this positive climate, major world events have set up shop in Spain; Barcelona homes the truly enormous Mobile World Congress (with a whopping 100,000+ attendees) year on year, in addition to 4yfn, Smart City Expo, IoT Solutions World Congress and more, while there is South Summit in Madrid and Startup Olé in Salamanca. All this data suggests strong momentum in Spain and that everything is moving in the right direction. But what are the nuances we can take from these positive signals to predict the future of the ecosystem? 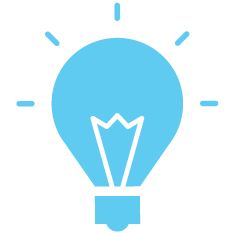 How can we learn from the successes and apply this knowledge both to our own investment strategy and the business development of our start-ups? Firstly, we can see in Spain a lot of success among B2C and C2C start-ups like Letgo, Glovo and Cabify… but none of these start-ups were the first to pursue these ideas. Letgo has Craigslist, eBay, OfferUp and Carousell to contend with (and had Wallapop before their merger), Glovo has Postmates and all the Deliveroo, UberEats-esque giants, and Cabify’s competitors are almost endless; Uber, Ola, Grab, Hailo, lyft, mytaxi… What they share is that they’ve all taken viable business models that have been proven abroad, and exploited the untapped Southern European market. Expansion to Latin America and the United States has then been the next step for these Hispanophone start-ups. With the Spanish GDP growth rate increasing steadily between 2012-2015 and then stabilising towards the present day… it will be interesting to see if corporate growth could translate to more B2B start-up success in the coming years. What is clear amongst all this is that Spain’s bitter recession years have bred a new type of Spanish entrepreneur. These founders have built business models primed for global expansion and set their sights on huge markets. That’s why we’ve set up a OneRagtime office in Barcelona – we believe there’s huge potential in the start-ups and the ecosystem both here and across Spain. There’s no reason to believe this momentum won’t continue, and every reason to expect more big rounds, big exits and big unicorns to come. eDreams – The online travel agency, launched in 1999 with its headquarters in Barcelona, was listed with an initial market value of approximately €1 billion for its IPO. Typeform – The form-filling SaaS that specialises in online form building and survey generation launched in Barcelona in 2012, with Crunchbase data putting its 2017 Series B fundraise at a substantial $35 million. Glovo – The Deliveroo, UberEats, JustEat rival was born in Barcelona in 2015, completing a cool €115 million Series C round with reports of valuation at more than €300 million. Cabify – This taxi-hailing unicorn raised $160 million at a valuation of $1.4 billion earlier this year, claiming that it grew 500% in gross revenues and travel requests in 2017, tripling its installed base. Ticketbis – Purchased by eBay for $165 million in order to expand StubHub into Europe, Latin America and Asia… this online ticket buying/selling platform secured a capital efficient return after combined fundraisings of just under $26 million. Privalia – Barcelona’s biggest ever exit back in 2016, Privalia sold to France’s Vente-Privee for around €500 million. 28 million customers and a sizeable return on a reported $189 million of funding. SocialPoint – Another big exit, the mobile gaming start-up Social Point was acquired by Take-Two for up to $276 million in 2017. Another top return after combined fundraises of less than $45 million. Carto – Founded in Madrid in 2012 as CartoDB, Carto offers location and data mapping to non-coders. Raising $23 million in its 2015 Series B lead by Accel, Carto was an Inc 5000 Fastest Growing company in 2017 with over 200,000 users globally. Devo – A $25 million Series C announced in June brought the total raised up to $71 million for this cloud service start-up, previously known as Logtrust. Fintonic – The personal finance management app raised a €25 million Series B and is currently operating in Spain and Chile with over 450,000 users.